A play around migration and its conflicts is at the heart of an ambitious new project of the Auckland based theatre group Prayas. Following the success of its earlier productions including Charan Das Chor by Habib Tanvir, and The Terrace by Madhu Rye, the group decided to write and stage its own play. “It was an ambitious thought,” writer-director Amit Ohdedar said. Khoj (The Search) was the result of intensive reading and discussions that he had with co-writers Sananda Chatterjee and Poorna Prakash. Dramaturge Fiona Graham facilitated the initiation; the rest was the creative talent of Prayas, led by Amit and his group. He believes that the play is a tribute to best-selling author Rohinton Mistry and his collection of short stories, Tales from Firozsha Baag. He was touched by the story of a Parsi migrant in Canada trying to come to terms with the difference in culture and lifestyle. The idea was truly intriguing and Prayas took the story further. The differences in lifestyle, funny and distressing, became the underlying euphemism for the various adjustment issues a new migrant faces in New Zealand. While the group did much of the writing, it went out to the community for ideas. A couple of public meetings in Auckland drew shared migration stories. Many of these, some funny and some not so funny, have a place in Khoj. “As a process it was fascinating; marvellous to see the loud laughter in parts and in others, to see future actors in this play trying to work its meaning and context. “The end product has a strong New Zealand-Indian feel,” Amit said. He said the play on stage would be exciting, although it is still being fine-tuned. After casting calls, it is currently going through the demanding process of rehearsal and refinement. Prayas is adding a unique dance drama feature to complement the play. The dance sequence runs parallel to the play and is being choreographed by Sharmista Chakraborty and her team. A mix of trained Bharata Natyam and contemporary dancers has begun rehearsals. 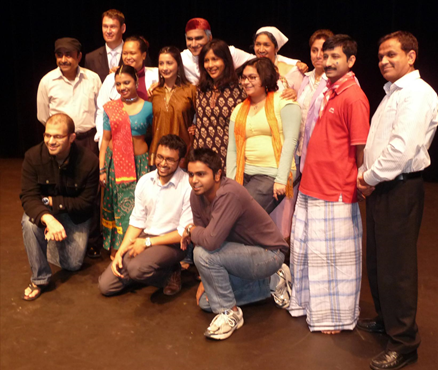 Last year, members of Prayas joined the Auckland City Council in a successful multiethnic play, Our Street. Sudeepta Vyas is the spokesperson for Prayas.